Not surprisingly it is more common to focus on bicep training opposed to tricep. But training your triceps are equally important, if not more, for an overall proportional shape, strength and definition. With this six move workout, comprising of two super-sets, we have compiled the perfect tricep training for you! Plus this will incorporate back, biceps and a slight chest impact, meaning you will define in next to no time. By performing the super-sets you are engaging the neglected muscle fibres, meaning your body will become stronger and gain muscle mass, giving you a sculpted, even definition and equal strength throughout each muscle group in the arm. This is a six-move session divided into three supersets. Do a set of move 1A and go straight on to 1B, sticking to the sets, reps and rest shown until all sets are completed for both. Then follow this same superset pattern for moves 2A and 2B, then 3A and 3B. Warm up thoroughly by doing three to four sets each of move 1A and 1B, starting with a low-weight, high-rep set. With each warm-up set increase the weight and reduce the reps until you get to your work-set weight. Tip: Having your elbows tight to your sides shifts the emphasis to your triceps. 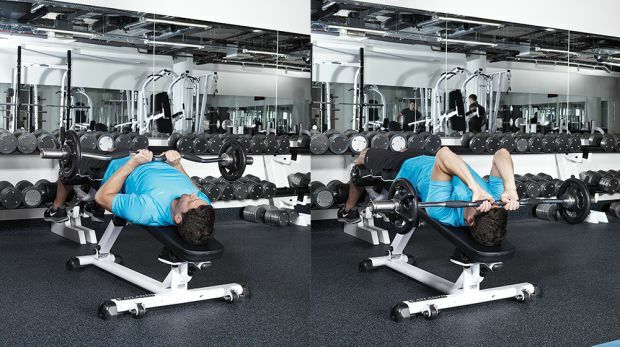 Lie on a decline bench holding an EZ-bar with a shoulder-width grip. Lower the bar to your stomach, keeping your elbows tight to your sides. Tip: It’s a great move to isolate your triceps and move them through a good range of motion. Keeping your elbows pointing straight up, lower the bar down towards your forehead. Pause, then straighten your arms to return to the start.